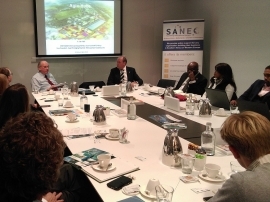 On the 15th of November 2016, SANEC and the Embassy of the Republic of South Africa in the Netherlands, organized a roundtable on South African Agro-parks and Aquaculture. The delegation present consisted of seven experts that came from, namely: the Department of Agriculture, Forestry and Fisheries, WESGRO and the Department of Trade and Industry. Insightful information on agro & aquaculture opportunities was provided. We wish to thank our strategic partner and board member of SANEC, Mr. Jan Hak, Chairman NAFTC-Africa for presenting the best practices of agro-parks, in particular in the Netherlands and South Africa, and for sharing his knowledge and cognizance on the sectors. We would also like to express our gratitude to our SANEC members for participating and supporting the roundtable. The Roundtable was moderated by SANEC's General Manager Mark Agterdenbosch and SANEC's Project Coordinator Babu Katanga. The first presentation was given by Mr. Jan Hak, whereby Agro-park case studies were analysed and discussed. Mr. Towfiq Hendricks, Portfolio Manager of Agribusiness for WESGRO, provided a description of the agency and its department of Agribusiness in the second presentation. WESGRO is the Official Tourism, Trade & Investment Promotion Agency for Cape Town and they are focused on attracting direct investment in the Western Cape Agribusiness sector. The third and last presentation by Ms. Khumo Morake, gave an in depth analysis of the investment opportunities in the aquaculture sector in South Africa. Several projects and research data from Operation Phakisa were explained and discussed at the roundtable. At the end, there was a Q&A session followed by an opportunity for guests to network and build sustainable business relationships. For a photographic impression of the event, please click here.